It wasn’t so many months ago when the weight lifting world was roused into a really fine fury. Charges and counter-charges flew thick and fast with bets, wagers, challenges and conditions laid on the line so heavily that the arguments were unheard above the steady thump of money bags. Friendships were broken and enemies made, and all because someone said that a certain famous bodybuilder couldn’t perform a certain number of repetitions in the two hands slow curl with a certain poundage. Long were the arguments and many the words but most of all of the people concerned missed one thing – NOT A SINGLE ONE OF THEM ever quoted the rules for the two hands slow curl! In fact, they had as much idea of what you could be ruled out for, and what constituted a GOOD curl as I have of building an atom bomb all on my little own. They called the lift the “Military curl,” “the cheating curl,” “the anything but the right name” curl, and they didn’t know in the slightest what they were talking about. Since there is no ruling in existence in this country governing the lift, it didn’t matter how the Curl was performed for the particular “King of Strength,” but everyone was trying to impress the other with his ideas as to how it should be performed, and if anyone else expressed thoughts contrary to the guy with whom he argued, then the dissenter was a louse and a stool pigeon of commercial interests! It really caused quite a stir and several guys, wise in the ways of those who make a fast buck, muscled in on the quarrel and built themselves quite big reputations. It’s all over now, but it isn’t forgotten because every so often, when I walk into a gymnasium, I see a little group engaged in heated words about how to do a strict curl and if the strict style of performance is better for bodybuilding than the cheating method. Now, all methods of exercising are good and of benefit, but there are certain rules which govern the lift when it is used as an attempt on a record or as a medium of competition, and these rules are applied by only one country, which happens to recognize no less than 42 different lifts that can be used for record-breaking and competition. Until those rules are recognized in this country, then I don’t see where any person can go telling another where he gets off insofar as the two hands curl is concerned. Anyway, no one agrees as to how a good curl should be performed and I might be the lone voice crying in the wilderness. So, whether you like it or not, I’m going to give you the rules for the curl and some assistance exercises that go along with it. If you are one of those fortunate or unfortunate beings – it depends on whether you are a weight lifter or a body builder what view you take – who can only exploit your strength an development by appearing in body building competitions, then the rules will, beyond any doubt, help you. The two hands curl, as it is popularly known in this country, is a very useful and necessary part of a weight trainer’s schedule. The style used is loose but the results gained from it are still good. I will touch but briefly on the anatomy of the biceps and restrict myself entirely to the method of using it and the benefits to be obtained from same. The two hands curl will build you an impressive looking muscle without adding greatly to the size of the upper arm as a whole. That function is reserved almost exclusively for the triceps which forms the major portion of the arm. Yet there is something very satisfying about the height and shape of the biceps, the two-headed split formed by the muscle. If you feel inclined to improve your performance and build up a larger upper arm in conjunction with the other muscles, then the assistance exercises and the rules that follow will help you a lot. Next time you see Melvin Wells, take a good look at his biceps. Notice the definition and SIZE. Wells is perhaps the one man who makes use of the ultra strict style called for in the rules that will eventually follow. Never a bit of a backbend or a shift of the upper arm when Melvin curls. With an arm of enormous strength and shapeliness, despite the terrific sweep of triceps, Melvin would lose considerably in size if his biceps were merely above average instead of being “out of this world.” I have seen Melvin perform repetition curls with 145 pounds – I forget the exact number of repetitions, but have the impression it was around 12 – without a single curl losing anything in style and ease of performance. Another strength athlete whose curling feats border on the incredible is Hermann Goerner. Here was a man who for sheer brutal power of arm and back has never been equaled. His favorite lifts were the dead lift and the curl and he loved to find different ways in which to lift a barbell of dumbells in these feats of strength. These lifts were made with almost every conceivable type of apparatus – grip – position. He used blockweights, kettlebells, dumbells, ring weights and human beings standing on bars that were already loaded to capacity. Judge the power of his arms – biceps, from the following lifts OFFICIALLY performed by him with competent officials acting as judges. Two hands slow curl with barbell – 220 ½ pounds. Performed on September 1st, 1932 at Leipzig. Two hands continental curl – 241 ½ pounds. Performed on November 4th, 1932 at Leipzig. Right hand slow curl with kettlebell – 110 ¼ pounds. Performed on December 14th, 1932 at Leipzig. Right hand slow curl with barbell – 121 ¼ pounds. Performed on April 17th, 1934 at Leipzig. His reverse curls were also terrific and if anything were more deserving of merit than his orthodox curls, but since we will deal with this lift in a future article, I will not quote these at this present time. All the above feats of strength were impromptu – that is, they were not specially trained for and were undertaken during his actual training periods in the gymnasium, and as officials happened to be present. It might well be that his powerful dead lifts had some effect on the power to curl, on the strength of the biceps, for the author has observed that curling was always easier when dead lifts were included in workout programmes. I hesitate to say that is conclusive for I have not had the opportunity to conduct the research necessary, but I can well imagine that the dead lift itself would have a psychological effect on curling, making the weight FEEL LIGHT in the hands, and the lifter, as a consequence, more confident of curling it to the shoulders. Here are the rules for the two hands slow curl as recognized by the British Amateur Weightlifters Association. Pay particular attention to the title of the lift and the reasons for disqualification. 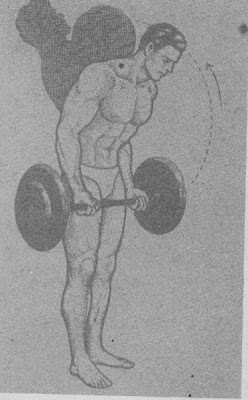 The barbell grasped with both hands (palms to the front) shall hang at arm’s length across the lifter’s front, from which position it shall be lifted to the shoulders by bending the forearms completely on the upper arms. 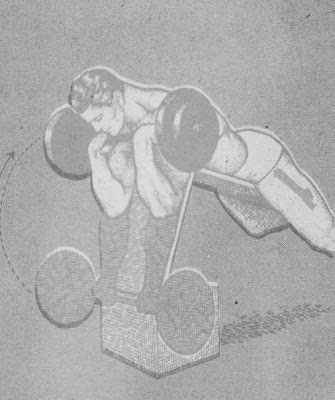 Throughout the lift the trunk must not be inclined backwards, forwards or sideways, the shoulders must be kept quite level, the legs straight. The slightest deviation from this position shall be counted cause for disqualification. 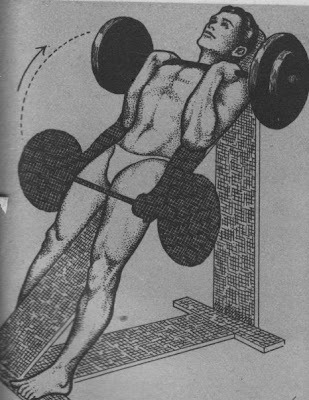 Altho a count is not insisted upon at the commencement of this lift, a pause must be observed and the lift must not be continued from the momentum gained by lifting the bar into the commencing position. So much for the rules. You will notice that the lifter is NOT FORBIDDEN to use a shrug of the shoulders, neither is he forbidden to pull the elbows back. So long as he maintains a perfectly upright stance with neither a forward, backward or sideways angle to the body, and providing he does not unlock the knees or slope the shoulders from one side to the other, the lift is a good one. The main function of the biceps muscle is to flex the forearm onto the upper arm AND to turn the hand palm uppermost – supinate it- and the exercises which follow are designed to make the most of the muscle function. There are instructions included in the exercises which explain the use to be made of the types of muscular action – the eccentric and concentric muscle actions. The exercises strengthen the biceps in its entirety – the muscle movements which call for a strict style affect the lower part, or “belly.” These are the incline curls and the cramping curls. 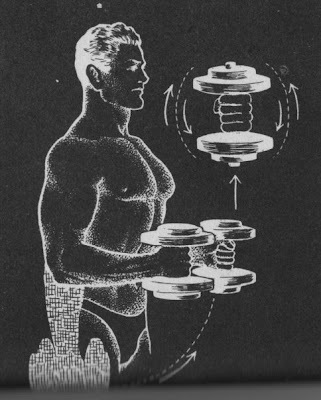 The higher portions of the arm are exercised with the cheating curls, the looser style enabling the weight trainer to get the barbell past the so-called sticking point and into the region where origin approaches insertion – where the muscle is STRONGER and can exert more power! 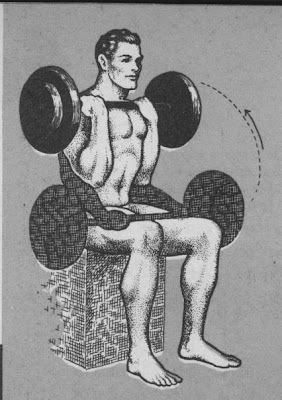 The supinating exercise forces the “peak” of the contraction and builds a higher shape while the seated curl with the barbell held across the thighs strengthens the biceps in the sticking point area. So you have in all six exercises which affect every part of the muscle – and remember, before you start your assistance exercises, there is NO SUBSTITUTE for the actual lift. Practice this FIRST and the assistance exercises AFTER and you will improve. Exercise 1. In all exercises designed to build up curling strength, full use must be made of the concentric and eccentric muscle actions. Together with reasonably heavy poundages, the biceps is developed to the full. It is the one muscle which provides ample and continued progress in size and strength. I have always called it a “psychological muscle” because the effect it has on the training outlook is profound, with the shape of the upper arm adding immeasurably to pleasurable training and perceived progress. As you may have read in previous articles, there are two types of muscle contraction – Concentric, when the origin approaches insertion – Eccentric, when the muscle acts as a brake and static when the muscle contract without actually functioning – takes up the slack! This first curling assistance exercise movement utilizes the heavy poundages, the concentric action and the eccentric action. It furthermore accustoms the biceps to handling progressively heavier poundages and it strengthens the muscle in the sticking point area. Sit astride an exercising bench and rest a barbell across the thighs and close to the groins. Take your usual curling grip and from this position, curl the barbell to the finish position, curl the barbell to the finish position. From here, SLOWLY LOWER the weight, fighting it every inch of the way, to the thighs. Start off with a weight 20 pounds below your limit and make 3 to 5 reps for 3 sets. Work up GRADUALLY to 10 reps for 3 sets before increasing the poundage by 10 pounds. Exercise 2. The single arm supinating curl. One of the main functions of the biceps muscle is to supinate the hand – turn it palm up. The movement considerably heightens the biceps and is a great delineator and definer. Take a dumbell which you can handle for 8 comfortable repetitions. Hold it in the commencing position with the knuckles to the side. From this position, curl it until the forearm is at right angles with the upper arm and when the dumbell arrives at this position, TURN the hand at the WRIST until the hand is PALM UPPERMOST. Rotate it in this manner without raising the dumbell any higher, then lower it to the starting position after THREE ROTATIONS and repeat. After each turning of the hand and wrist make a special effort to twist it a fraction of an inch further. Start off with 3 sets of 8 reps and work up to 3 sets of 15 reps before increasing the exercising poundage. Exercise 3. One of the most successful biceps curls is the bench cramp curl. Take an exercise bench and lie along its length on your stomach so that your upper arms can rest on one support or end. To gain the bench height necessary, stand one end on a box. With the barbell held in your hands with a CLOSE grip, and keeping the UPPER ARMS STILL throughout the entire exercise, curl the barbell to the chin. HOLD the contraction for a short count of two, an then LOWER SLOWLY and repeat. Start off with a weight you can comfortably handle for 8 repetitions, 3 sets and work up to 3 sets of 15 reps before increasing the exercising weight. Don’t forget – LOWER the weight slowly, feeling the resistance every inch of the way. Exercise 4. Stand back of an incline bench and lay your ENTIRE arm along it so that the top of the board rests just under your armpit. The board should be sloped at its greatest angle. Hold a dumbell in your hand while keeping the UPPER ARM absolutely motionless, curl the bell up until it touches your shoulder. Lower as SLOWLY as you can and repeat. Commence with a weight which you can JUST handle for 5 reps, 2 sets and work up to 2 sets of 10 reps. Again, it is important to LOWER the dumbell as slowly as you can – and – DON’T move that upper arm! Exercise 5. There is another favorite curling exercise which helps to increase the starting power of the curl. Adjust the incline board to its steepest angle and lie on it with a barbell held in the hands with a FAIRLY narrow grip and across the thighs – the hands should be so close that they TOUCH the thighs. From this position curl the weight to the upper chest keeping the arms tight against the sides of the body. Lower as slowly as you can and repeat. Start off with a weight you can comfortable handle for 6 reps, 3 sets and work up to 3 sets of 12 reps. Place a lot of emphasis on a CONTROLLED lowering of the bar. Exercise 6. For building bulk and power in the upper arm, heaving curls are tops. They are particularly valuable in getting the biceps used to handling heavy weights and toning up the entire biceps brachii region. Take a weight equal to your LIMIT poundage on the curl in CORRECT STYLE as outlined in the rules earlier on in this article. Stand with the body bent slightly forward and the bar touching the thighs. Straighten the body and at the same time give a heave and curl the weight to the shoulders – timing the effort so that the power of the body heave is coordinated with the action of the arms. Make every effort to lower the barbell as slowly as you can and repeat when it arrives at commencing position with NO pause in between reps. Start off with 3 sets of 5 reps and work up to 3 sets of 10 reps. In all these exercises, concentration on every movement is of the utmost importance. All the time, think of the action of the muscles – flexing the forearm on the upper arm and supinating the palm. Only by attention to every detail can your lifts improve and your strength increase.